Gamaka or Kavyavachana is a special ancient art of Karnataka. This is one among the 64 vidyas mentioned in the Hindu puranaas. The origin of Gamaka goes back to the age of Ramayana. 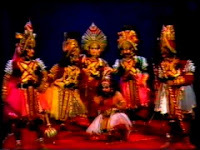 Adikavi Valmiki taught Ramayana to Lava and Kusha, his disciples in Gamaka form. These two boys sang the whole of Ramayana in musical form before the great Sri Rama. Gamaka is the art of singing classical literature in musical form. Kannada literature is enriched by the classical poetic kavyas of the great poets like Pampa Ranna, Harihara, Raghavanka, Naranappa of Gadag Lakshmeesha, Torave Narahari. These literature are sung in different ragas, according to the meaning bringing out the poetic beauty. Gamaka is the perfect combination of "Kavya" or Literature and music. Artist who sings 'Gamaka' is known as 'Gamaki'. An able Gamaki should be well versed in both Music and Literature. Gamaka' programme usually will be scheduled by two artists. The 'Gamaki' will sing the kavyas and the other 'Vyakyanakara' will explain the same. Gamaka is a form of story- telling wherein, One person sings a stanza of a poem, applying suitable ragas to it so that is will be melodious to hear. Another person then explains the meaning of the stanza with examples and anecdotes. It demands an in-depth knowledge of Carnatic music, old Kannada epics, the meter(s) of poetry, and the epics and puraanas. Gamaka brings alive great epics for the benefit of the common man. Gamaka draws raagas from traditional Kannada folk Dhaati(tunes) and Carnatic music . The singing itself is called Gamaka and the singer a Gamaki. The explanation of the rendering is called Vyakyana. Most noticeable thing in this art is that the singing has no rhythm. A Vyakhyana is a running explanation in an easier language of what is said in the original, with little elucidations here and there. A Vyakhyana, particularly of a Kavya, deals with eight different modes of dissection of the Sloka, like Pada-Chheda, Vigraha, Sandhi, Alankara, Anuvada, etc. This forms an important aspect in the study of Sanskrit and Kannada Sahitya Sastra. An Anu-Vyakhyana - like the one written by Sri Madhva - is a repetition of what is already written, but in greater detail. An Anuvada is merely a running translation or statement of an abstruse text of the original. Tika is only another name for Vyakhyana. The best Vyakhyanas are of Vachaspati Misra on the Darsanas, especially on Sankaras Brahmasutra-Bhashya. Gamaka is centuries old, believed to date back to the time when Valmiki narrated the Ramayana and twins Lava-Kusha sang them. Earlier Gamakis were part of Maharaja's court, but their art was not limited to the palace. They sang at temple, wedding, village katte, popularising it among the people. The art slowly faded away but was revived during the 1900's by eminent persons of literature like Prof. A.R. Krishna Shastry, D.V. Gundappa and others. Gamaki gained ground during G. Narayana's tenure as Kannada Sahitya Parishat's President and later as Karnataka Gamaka Kala Parishat's President since 1982. Gamaka as the art of effective recitation of poetry, is probably as old as poetry itself. Poetry being intended to be recited and heard rather than read from the printed or manuscript page and not all poets being adept or effective in presenting their compositions to full effect, a person who specialised in the art of recitation and helped the poet to achieve his/her effect appears to have coexisted with him/her from early times. 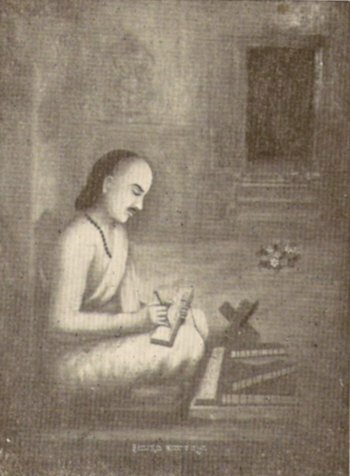 Appellations like "Gamaki", "Vadi" and "Vagmi" are frequently mentioned in early works as the appellation "Kavi"(poet) does. The royal courts of ancient times had places of equal honour for all these. Early poets like pampa and ponna are clearly referred in this context. The Gamaki enjoyed a place of distinction in royal courts and enjoyed public esteem next only to that of the poet. Keshiaraja in his sabdamanidarpanam has mentioned Gamaka. There are references in the inscriptions to persons who excelled in this art and enjoyed royal patronage. An Inscription of 1068 described Gangarasa as a great lover of four kinds of artists mentioned earlier(kavi,gamaki,vadi and vagmi). Another inscription of 1255 extols the unsurpassed excellance of one Traividya Balachandra in these arts. Another one of 1533 of the time of Achchyutaraya tells us about a lady of Tirumalamma who was a great gamaki besides poetess on her own right. Innumerable inscription record grants made to persons for reading and reciting puranas in temples for the benefit of the listeners. Several kannada works from Kavirajamarga down to Bharaesha vaibhava not only bestow high praise on the gamaki but also describe him in action and accordingly define the qualities that go to the making of a great artist in that line. He has poessess a good voice and have the capacity to understand the different sentiments to be expressed and the art of modulating his articulation to suit the sentiment and the situation. Music and Musical accompaniment may have a place in the art, but no more than what can aid and augument the expression of the literary content and intent of the work. An overdoes of music may obscure the literary worth of a poem and its total absence may diminish the depth and intensity of its appeal. The art of effective recitation of poetry, which is gamaka, has to achieve a happy compromise between the two. That is the gist of what poets like kumaravysya and Laksmisha expected this artist to do. There have been many who recited particular works so well and effectively that their names got attached to work themselves. Udayagiri varadani Ramayya and Gubbi Mallanarya became famous for their reading of Basavapurana so much as to join the names of the work and the reciters as if the work belong to them. In our own times we have seen that Bindurao came to be known as Bharata Bindurao because he specialised and excelled in the recitation of Kumarvysya's work. Gamaka includes rendition of the verses in epics like Torave Ramayana and Kumaravyasa Mahabharata set to a classical raga, and an interpretation of the same with a brief explanation generally called vyakyana. The poems are chosen mostly from old Kannada epics such as 'Karnataka Bharatha Kathamanjari', Jaimini Bharatha, Harischandra Kavya, dEvi bhAgavata, and Torave Ramayana. Vachanas are also rendered in Gamaka Style. This is called Gamaka Vachanas. It is also uses Hindustani ragas for rendering the music. Kumara Vyasa's works belong to the Nadugannada (Middle-age Kannada) period of Kannada literature. His influence on later Kannada literature is significant. Gadugina Bharata is still widely read. It is popularly sung in a unique style known as Gamaka. 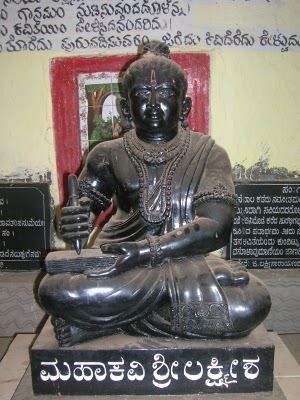 Kumara Vyasa's most famous work, the "Karnata Bharata Kathamanjari" (The Mahabharata of Karnataka)is popularly known as Gadugina Bharata and Kumaravyasa Bharata. 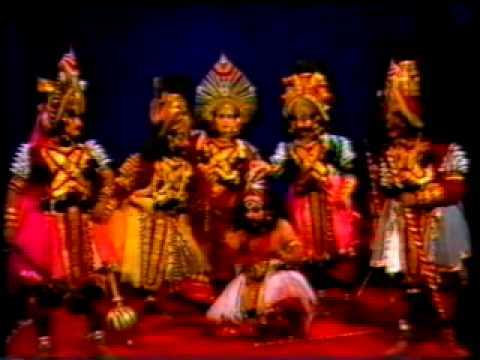 It is a sublime adaptation of the first ten Parvas (chapters) of the Mahabharata. A devotee of Krishna, Kumara Vyasa ends his epic with the coronation of Yudhishtira, the eldest of the Pandavas. The work is easily the most celebrated in Kannada literature. Its fame arises due to its universal appeal. Gadugina Bharata is entirely composed in the "Bhamini Shatpadi" meter, a form of six lined stanza. Kumara Vyasa explores a wide range of human emotions, examines values, and displays extensive mastery over vocabulary. The work is particularly known for its use of sophisticated metaphors. It has earned him the honor of "Rupaka Samrajya Chakravarti" (Emperor of the World of Metaphors). Kumara Vyasa is also renowned for his characterization. "Karnata Bharata Kathamanjari" is also known as Dasha Parva Bharata because it originally had only 10 parvas as opposed to the 18 in the original Mahabharata. It is said that Kumara Vyasa died before completing the remaining 8 parvas. There is a strong belief among locals that Kumaravyasa was a blessed poet of Sri Veera Narayana i.e Lord Vishnu. The poet used to sit in front of sanctum sanctorum in the temple and the Lord himself narrated the story of the ancient Mahabharatha from behind the statue. The poet transformed the story into an excellent poetry. Kumaravyasa has shown an exemplary style of writing in the introduction. He proudly claims that his poetry is matchless and that it caters to the taste of all kinds of readers. He writes "A king enjoys the valor in the poetry, A brahmin the essence of all vedas, Philosopher, the ultimate philosophy, ministers and state administrators the tact of rule, Lovers, the inspiration. Besides this he proudly acclaims that this work of his is the "GURU" of the works of all other great scholars." However, his self-lessness may be noted when he says he merely noted all that was narrated by his lord, his actual poet". The other, lesser-known work of Kumara Vyasa's is "Airavata." Some of the early Gamakis included Abhinava Kalidasa Late Basavappa Shastry, Late Bharat Bindurao, Late Krishnagiri Krishna Rao and Late Shakuntalabai Panduranga Rao while the recent names include B.S.S. Koushik, Hosahalli Keshavamurthy, Gangamma Keshavamurthy and others. 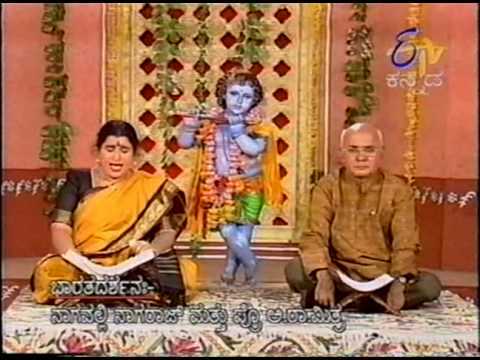 Gamaka Gandharva and Rajyothsva Prashasti puraskrutha Hosahalli H R Keshava Murthy is a living legend of Gamaka. Gamakakalanidhi Basavappa Shastri was one of the famous Gamaka singers. Among popular Gamakis are Rajyothsva Prashasti and Kanaka Purandara Prashasti puraskrutha Basavapatna Subbaraya Kaushik, Rajyothsva Prashasti puraskrutha Hosabale Seetharam Rao, Narahari Sharma Kerekoppa, Mattur Ramamurthy, Raghavendra Rao and Kam Su Venkatadri Sarma. Karnataka Gamaka Kala Parishat (Academy of Gamaka Art, Karnataka) is an organisation that is formed to support and encourage the Gamaka Art form. Over the last 28 years, Karnataka Gamaka Kala Parishat has been working in Bengaluru to popularise the art of Gamaka. The Parishat has its branches in all the districts of Karnataka. There are about 450 active Gamakis, of which over 100 are in Bengaluru. 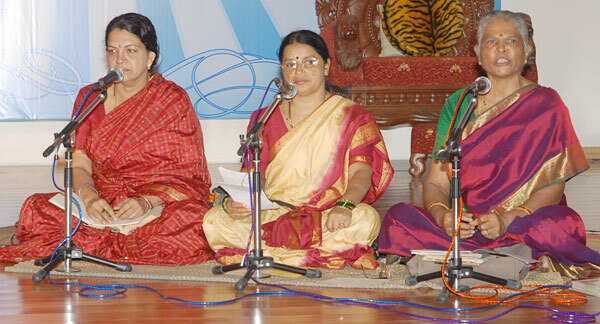 Kannada Sahrudaya Prathistana conducts Gamaka recitals throughout the year at the famous “Kumara Vyasa Mantapa”, Rajajinagar. Gamaka, though it is essentially the art of poetical recitation, has not always remained so confined. Varadachar and Gurudanagiri Nagesh Roa were well known for their rendering of "Kanda" verses from the stage. In rendering shatpadis effectively Balakawadi srinivas Iyengar and Chikka Rama Rao had made a great name. Basvappa Shastri enjoyed great reputation for his reading of Bharata. The art of Bhagavata in Yakshaganas is not very different from that of the gamaki proper except that his rendings subserves the immediate purpose of the dramatic situation to be enacted. The singing of the Bhagavata links up the sophisticated art of the gamaka with the unsophisticated art of folk song. The Gamaka not only requires talented Gamaki's and Great works but also Enlighted audience. The Audience quest for Knowledge and Enlightenment, which you find abundantly in Karnataka has contributed to the flourishing Gamaka tradition. Not till very long ago kumaravysya's Bharata and Lakshmisha Jaimini Bharata were very commonly read to rural audiences in karnataka. Such sessions served the purpose of both entertainment and enlightenment. The Gamaka Tradition was thriving in 9th century AD as seen from the words Gamaki and Gamaka used to refer to the artists. Even if less than before, these and other classics of kannada poetry continue to be popular when recited by competent gamakis. One more work in the form of kuvempu's Ramayana darshanam has been added in recent gamaka repertoire. Among gamakis who acquired fame during the last few decades of this century the prominent ones are krishnagiri krishna rao, kalale sampathkumarachar, Bharat Bindu Rao, K.T.Ramaswami Iyengar, H.K Ramaswami , chandrasekharyya, Raghavendra Rao, Shakuntalabai panduranga Rao and Kaushik. All of them displayed mastery in the ancient and popular art of poetical recitation and have successfully maintained the old tradion.